The 2302A Curtain Door magnetic contacts are designed specifically for curtain style overhead doors. 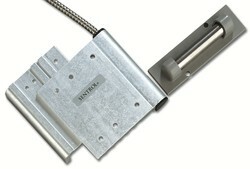 The unique design allows the contact to be mounted directly to the channel of the door, with the magnet mounted horizontally in the door slats, off the floor and out of harm's way. This eliminates the service calls and alarm situations that are created when typical floor-mount contacts become damaged, or as the door becomes misaligned with normal usage. The interlocking mounting bracket adjusts to fit any size channel width. - 2302A-L Closed Loop, N.O.